On Friday, July 15th Leopold’s Ice Cream was featured on the top rated daytime talk show, The View! The producers of the hit show chose their five favorite ice cream shops from across the country, in honor of national ice cream month. 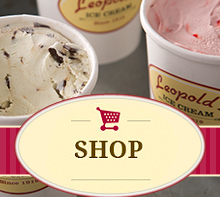 Many great ice cream shops were featured, but Leopold’s was proud to represent the classic soda-fountain of yesterday. As if that weren’t a nice enough tip of the hat, Unwrapped host and Food Network star Mark Summers introduced Stratton as “The King of All Ice Cream”. The full episode (Episode 203) is available for view on HULU for a short time! Make sure to check it out! « Leopold’s 92nd Birthday Party Saturday, August 20th!